KATHMANDU, Dec 26: The National Reconstruction Authority (NRA) has said that the government is firm in its decision to provide Rs 300,000 housing grants to those whose houses were destroyed by last year's earthquakes, and this despite reservations on the part of international donor agencies. Secretary at NRA Sanjay Sharma said that international donor agencies, mainly the World Bank and Japan International Cooperation Agency (JICA), have been pressing the government to roll back its decision to provide an additional Rs 100,000 to the quake victims on top of the Rs 200,000." "Even though the government has already announced an increase in the grant amount to Rs 300,000 from Rs 200,000, the donor agencies have continued to make this issue a bargaining tool with the NRA. But we have made it clear we are not going to give in," Sharma said at a press meet organized at the NRA offices to inform the public about the achievements in the overall task of reconstruction and rehabilitation in the last one year. Monday will mark one year since NRA's establishment. Bhisma Bhusal, acting spokesperson of NRA, said the donor agencies have been stating that they are unable to fund the increased Rs 300,000 housing grants for quake victims. "They are saying that if the government does not roll back its decision to increase the housing grant, they will provide money for only Rs 200,000 and the additional Rs 100,000 will have to be covered out of state coffers," Bhusal said. Sharma said that NRA is trying to persuade the donors to support the government decision. "They are simply trying to win a losing battle," he added. 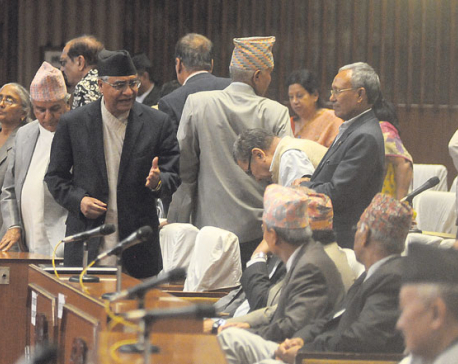 Prime Minister Pushpa Kamal Dahal had announced an increase in the grant amount to Rs 300,000 from Rs 200,000. Following that decision, NRA has decided to provide Rs 50,000 in the first tranche, Rs 150,000 in the second and Rs 100,000 in the third tranche, and has accordingly drafted an amendment to the grant distribution directives. Chief Executive Officer at NRA Sushil Gyewali said that the donor agencies are pressing NRA to roll back the decision to provide an additional Rs 100,000 as they are worried about managing the additional financial resources needed to support the new decision. According to him, an additional Rs 100 billion will be required to cover the increased grant amounts of Rs 300,000. As many as 626,036 victims in the 14 most-affected quake districts have been identified as eligible for the grant amounts and 543,107 of them have already received the first tranche. "Similarly, they are also worried that the quake victims may not actually reconstruct their houses after taking the second tranche of Rs 150,000, but we have assured them that NRA will carry out strong monitoring to make sure the grant beneficiaries carry out the reconstruction," he added. Gyewali said that the government's announcement to provide Rs 300,000 will not be rolled back just because donor agencies are pressing NRA to do so. "The decision to increase the housing grants has given the quake victims confidence that they can reconstruct their houses. So, it makes no sense to go back on the decision," he added. The draft of the directive to implement the government's announcement has been finalized and is likely to be endorsed at the upcoming cabinet. Earlier, various INGOs had also informed NRA in writing about their inability to fund the Rs. 300,000 housing grants to earthquake victims, saying they have been facing difficulties arranging the necessary resources.